These DC Councilmembers want faster bus service on 14th Street. Does yours? Four years ago, WMATA came up with an idea to add faster bus service to 14th Street NW in DC. It didn’t work at the time, but the idea is back, and this time riders and neighbors are working to make sure it happens. Five DC Councilmembers have recently promised promised to fight for the necessary funding. The need for better service is nothing new. Neither is the solution. All of DC has experienced tremendous growth in the past decade, but the 14th Street corridor in particular has seen an influx of both residents and businesses. In the past five years alone, the DC Office of planning shows that the number of businesses in this area has nearly doubled from 7,371 in 2011, to 13,992 in 2015. The office also estimates a growth of over 13,000 residents along the corridor from 2010-2014. It comes as no surprise, then, that bus ridership is up: nearly 15,000 people ride one of the 14th Street buses (the 52, 53, or 54) on a typical weekday, which is among the highest ridership in the Metrobus system. It’s also not surprising that the buses are frequently overcrowded and often get stuck in congestion. Four years ago, WMATA studied how to solve the problems on the existing lines. 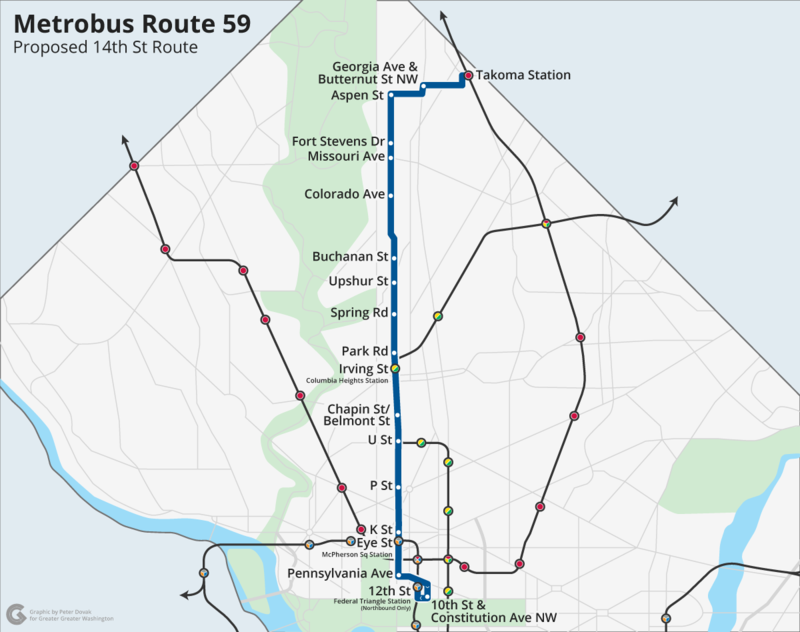 One of the recommendations that came out of the study was to add a new service, a 59 bus, that would run from the Takoma Metro station to Federal Triangle while only making a limited number of stops. The 59 would drastically reduce commute times for residents and workers along the corridor as well as take pressure off the current buses. When proposed, WMATA estimated that making the new route happen would cost just over $1.2 million. Image by Peter Dovak used with permission. Last time, lack of political support left the 59 with no funding. It will be different this time. The initial 59 proposal never found enough support in previous city budget negotiations, and the idea fell by the wayside. Of course, the 14th Street corridor continued to grow. Today, residents and riders are calling for the city to revisit the issue. And this time around, they are finding that the political landscape is different. I strongly support the creation of an express bus line on 14th street. With increased residential and commercial development along that corridor, there has never been a more important time to make this critical investment in our transportation network…Ward 4 cannot wait any longer for more robust and efficient transportation options. As the population along 14th Street continues to grow, it’s vital that we provide additional service in this well-utilized corridor… Access to reliable bus service is essential for District residents, and express service on other bus lines has provided relief to those who rely on transit to get around the city. At-large councilmembers Robert White, Elissa Silverman, and David Grosso, along with Ward 6's Charles Allen, have also said they support the new bus service. In order for the 59 to become a reality, the city has to set aside the necessary funding in its budget. The Mayor will submit her budget proposal and the DC Council will debate and amend it before a final approval in late spring. Now’s the time to ask our leaders to ensure that money for the 59 is part of that proposal.